Our Farm Walks are fun, educational and interesting – the perfect trip for families and adults, and they make the perfect gift that’s just a bit different from the norm. Order a gift voucher and we’ll post a colour printed gift voucher and envelope to you, for you to gift to the recipient. 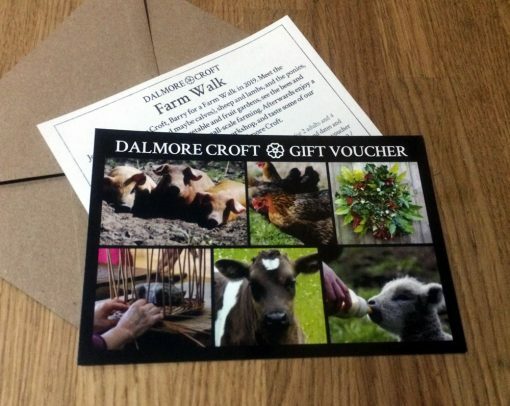 The recipient can redeem the voucher for any of our farm walks in the 12 months after the voucher is issued. We host walks between April and September each year, at weekends and on weekdays. Dates are released at least one month in advance, redemption is subject to availability. Prices include refreshments after the tour – a soft drink, milkshake, tea or coffee, and a piece of home-baking. As Joseph said, ‘best time ever!’ Had a brilliant morning, the children LOVED the freedom to play with the dogs and meet the sheep and brush the pony. I loved it too : ) Great hosts, could have chatted all afternoon. Thank you! fantastic experience, my children had an adventure they will remember for a long time! such generous hosts with a fabulously comprehensive knowledge they are keen to share and pass on. their enthusiasm with us all was fantastic. we are already looking forward to our next visit! and the milkshakes and cakes to round off the afternoon were DELICIOUS! What a wonderful afternoon we spent in the company of Rosemary and Dan on their wonderful farm. The kids (and mums!) thoroughly enjoyed sampling the freshly grown fruit and veg, feeding the animals, listening to all the fascinating information about farm life then chatting over a coffee and homemade scone with jam. This is definitely a “must-see” attraction in Angus!